The Equity Risk Premium-the difference between the rate of return on common stock and the return on government securities-has been widely recognized as the key to forecasting future returns on the stock market. Though relatively simple in theory, understanding and making practical use of the equity risk premium concept has been dauntingly complex-until now. In The Equity Risk Premium, financial advisor, author, and scholar Bradford Cornell makes accessible for the first time an authoritative explanation of the equity risk premium and how it works in the real world. Step-by-step, his lucid, nontechnical presentation leads the reader to a new and more enlightened basis for making asset allocation choices. Cornell begins his analysis by looking at the equity risk premium in the light of stock market history. He examines the use of historical data in estimating future stock market performance, including the historical relationship between stock returns and risk premium, the impact of survival bias, and the effect of long-horizon stock and bond returns. Using the stock market boom of the 1990s as a case study, Cornell demonstrates what equity risk premium analysis can tell us about whether stock prices are high or low, whether the stock market itself may have changed, and whether indeed a new economic paradigm of higher earnings and dividend growth is now in place. Cornell analyzes forward-looking estimates of the equity risk premium through the lens of various competing approaches and assesses the relative merits of each. Among those scrutinized are the Discounted Cash Flow model, the Kaplan-Rubeck study, the Welch survey, and the Fama-French Aggregate IRR analysis. His insights on risk aversion theory, on the types of risk that have been rewarded over time, and on changing investor demographics all supply the sophisticated investor with important pieces of the risk premium puzzle. In his invaluable summing up of the equity risk premium and the long-run outlook for common stocks, Cornell weighs the evidence and assays the impact of a lower equity risk premium in the future-and its profound implications for investments, corporate decision making, and retirement planning. The product of years of serious analysis and hard-won insights, The Equity Risk Premium is essential reading for institutional investors, money managers, corporate financial officers, and all others who require a higher level of market analysis. "The Equity Risk Premium plays a critical role in legal and regulatory matters related to corporate finance. Along with the cost of debt, it is the most important determinant of a company's cost of capital. As such, it is an integral part of the decision-making process in corporate finance. For instance, whether or not a major acquisition makes sense can depend on the assumed value of the equity risk premium. In addition, the equity risk premium is an issue that regulatory bodies consider when they set fair rates of return for regulated companies. 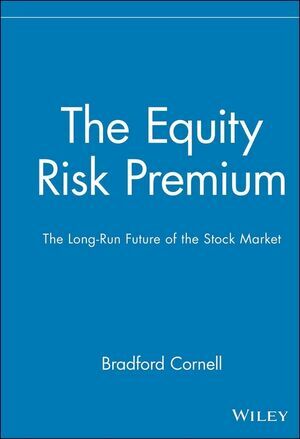 Cornell's book is an important contribution because it includes both an historical analysis of the equity risk premium and provides tools for forecasting reasonable levels of the risk premium in the years ahead. "-Theodore N. Miller, Partner, Sidley & Austin. "Estimating how well stocks will do in the future from how well they have done in the past is like driving a car while looking in the rearview mirror. Brad Cornell provides us with an important forward-looking view in this easily understood guide to the equity risk premium and confounds the popular view that stocks will do well in the future because they have done well in the past. "-Michael Brennan, Past President of the American Finance Association and Professor of Finance at the University of California at Los Angeles. BRADFORD CORNELL is President of FinEcon Financial Economic Consulting and Professor of Finance at the Anderson Graduate School of Management at UCLA. A frequent contributor to professional and academic journals, his writing has also appeared in the Wall Street Journal and the Los Angeles Times. "An understanding of the equity risk premium is important for informed financial decision making. Cornell's book does an excellent job tying together historical, empirical, and theoretical analysis of the premium in a package accessible to practitioners as well as academics." -Eugene F. Fama, Robert R. McCormick Distinguished Service Professor of Finance, University of Chicago. Measuring and Assessing Stock-Market Performance. Forward-Looking Estimates of the Equity Risk Premium. Risk Aversion and the Risk Premium Puzzle. The Risk Premium and the Stock-Market Boom of the 1990s. The Equity Risk Premium and the Long-Run Outlook for Common Stocks.